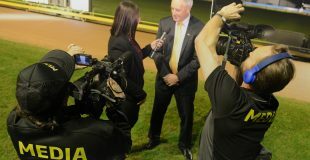 RSN Sandown Cup winner Sweet It Is made a sensational return to the track tonight with a dazzling last-to-first win in her heat of the National Distance Championship at Sandown Park. Having her first start since her barnstorming win in the world’s richest staying race, Sweet It Is began fairly but was soon shuffled back to last approaching the first turn. Despite finding trouble throughout the run, Sweet It Is worked her way through the field, eventually reeling in early leader Liara Allen and scoring by half a length in 42.12 seconds. “It was a great effort,” said Darren Pattinson, deputising for trainer Darren McDonald. Despite the modest time, the run signalled an ominous warning for her rivals as given it was the dual Group 1 winner’s first start in 10 weeks. “She was just a little bit sore after the Sandown Cup. It wasn’t a major thing and she was probably ready for a rest anyway, but she’s come back really well,” said Pattinson. Joining Sweet It Is in next week’s final is the country’s second highest prize money earner, Xylia Allen, who rebounded brilliantly after her disappointing run last time out to record an impressive win in 41.70 seconds. Landing behind Looby Lu, Xylia Allen stalked the lamp lighter before sweeping past in the back straight and powering away to win by 4.5 lengths. The $7200 first prize took her career prize money to a staggering $689,375. Mepunga Tiara scored an impressive all-of-the-way victory in 41.95 seconds. The last start Group 2 winner was brilliant at the beginning and the end of the night’s opening heat, scoring by 9¾ lengths over Born Ali. The vastly improved Zipping Rory set the time standard when he defeated Dyna Willow by two lengths in 41.67 seconds. Zipping Rory has now been placed in his last 10 starts – five of them wins – a streak that began with a Tier 3 win over 450m at Shepparton. The Beth Dapiran trained son of Sandown Cup winner Mantra Lad will now line up for a chance to represent his state in one of greyhound racing’s most prestigious races. The winner and runner up of each of tonight’s heats will line up in Thursday night’s Victorian final, with the winner to ‘fly the Big V’ in the $75,000 to-the-winner Grand Final, to be run at Cannington in Perth on Saturday 23 August. *Sweet It Is is ensured a berth in the National Distance Championship Grand Final by virtue of being the highest ranked (as determined by the Australian Greyhound Racing Association) stayer for the last 12 months. 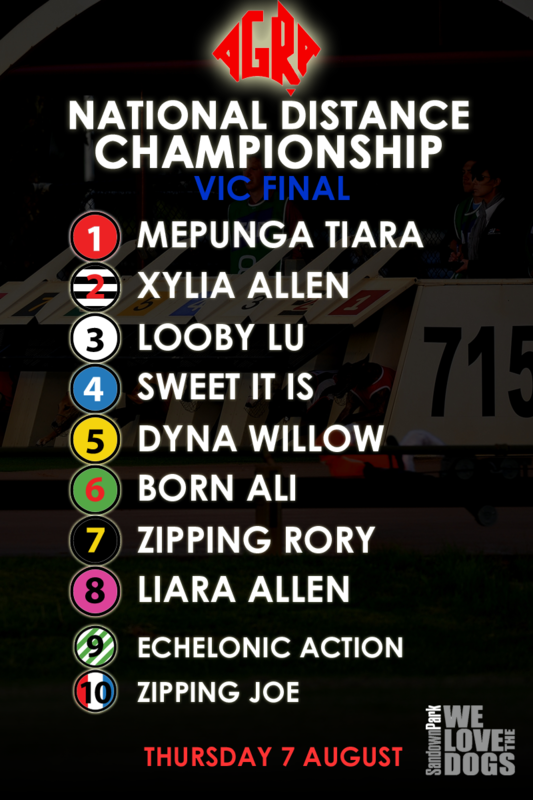 Should Sweet It Is win the Victorian Final, the second ranked greyhound Dyna Willow will progress to the Grand Final as the AGRA ‘Wildcard’. Click here for full results from tonight’s meeting.